From the creators of Ironlak, the world's first hybrid water and alcohol based acrylic aerosol paint. 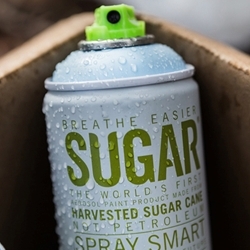 Sugar is harvested specifically to deliver the highest quality results for artists, with the lowest possible impact on your health and our environment. 400 ml vibrant color. Highly opaque. Matte finish. Soft pressure. UV resistant pigments. Extremely low smell. Clean, crisp control. Does not contain lead or other heavy metals.